Is Jobs Engine Running Out of Steam? After experiencing optimism earlier in the year, there are signs that the U.S. jobs engine might be slowing. Certainly, the turmoil experienced in China, Europe, and the Middle East are finally starting to drag down the economy. Then the lack of robust business investment is especially problematic. Unless that turns around soon, we might be approaching recessionary status. The Bureau of Labor Statistics released its jobs report for September and it showed a steady unemployment rate of 5.1 percent with an increase of 142,000. Labor force participation rate continues its steady trickle downward to 62.4 percent, though the employment to population ratio showed a modest tick up to 59.2 percent. Even though the unemployment rate remains steady, the rate of job growth has slowed. Over the last three months covering July-September, we have experienced an average of 167,000 jobs. That is almost a 30 percent decline from last year’s rate. With construction, manufacturing and wholesale trade showing little change, that offers a hint that this downward trend could continue as we head toward winter. 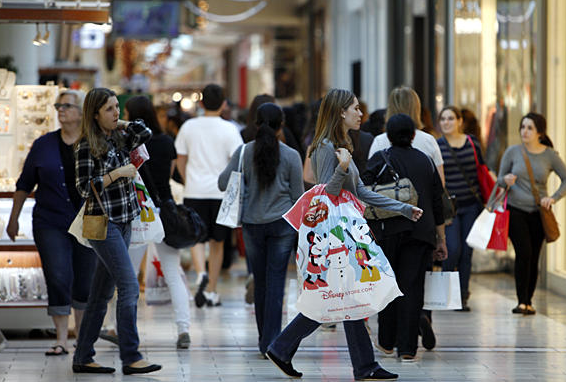 It is troubling that business investment hasn’t followed suit with consumer spending. Though household spending has been relatively healthy at 3.2 percent over the last year, we cannot say the same for industry. Even though some of that can be attributed to uncertainty from various political and global events, it will be difficult to maintain a robust economy without further investment. 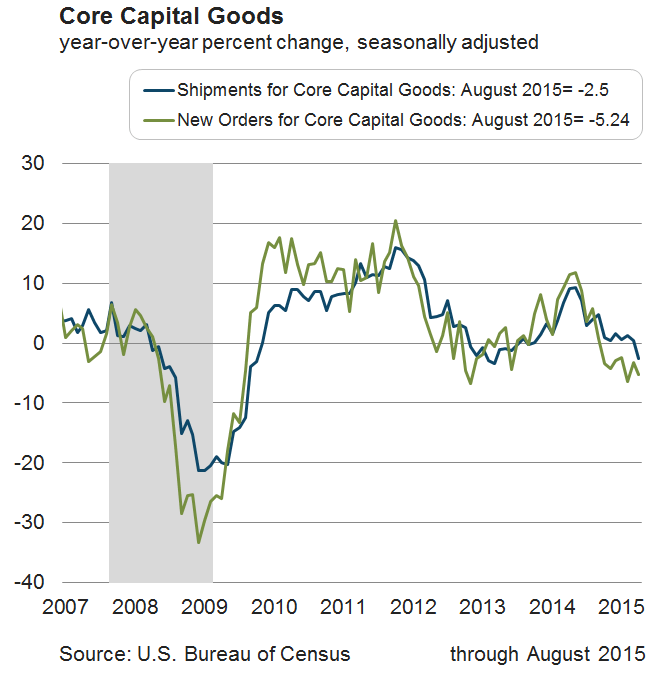 Both shipments and new orders of core capital goods have shown negative growth over the last year. Another issue is that wages remain stagnant. Over the last year, wages have grown at a 2.2 percent pace, which is well below what we experienced pre-recession. Until we see wages approach the 3 percent clip, it will be difficult to imagine a more robust economy in the future. Is this the beginning of a downward spiral? 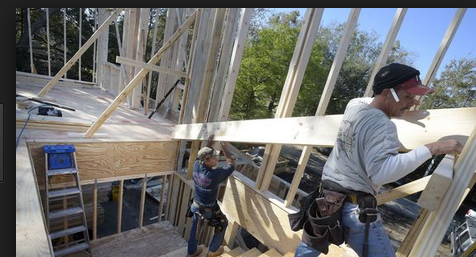 The February jobs report was released by the Bureau of Labor Statistics on Friday. It paints a relatively rosy picture with solid job growth of 295,000 and a declining unemployment rate that reached 5.5 percent. 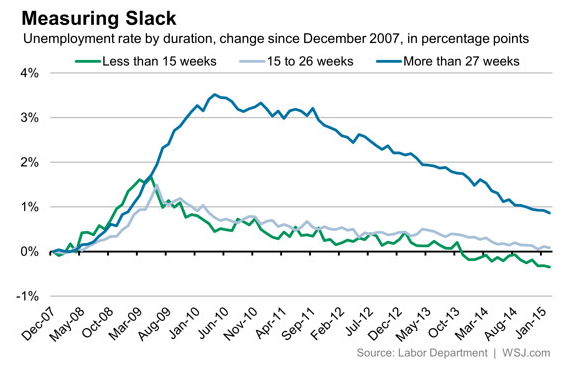 Wall Street Journal’s Real Time Economics provides an informative snapshot of the recent job trends in employment. Chart 1: Year-to-year job gains are steadily rising. 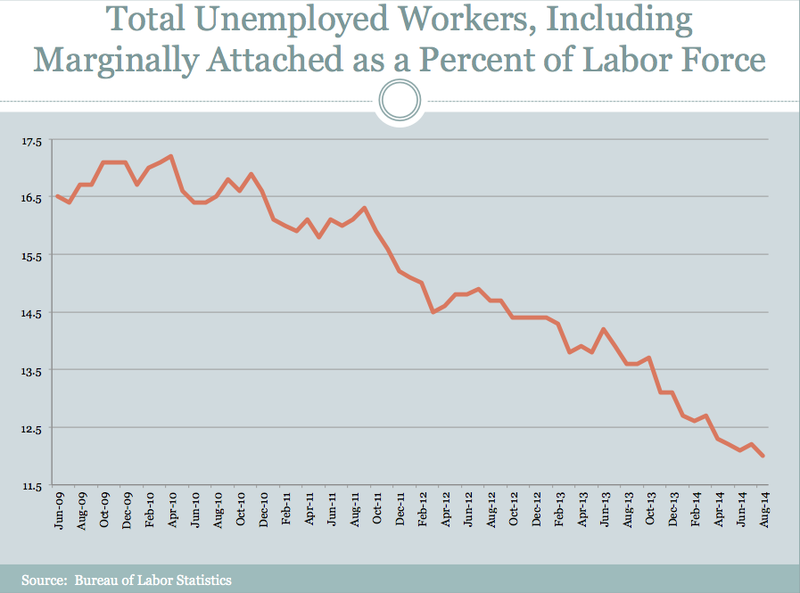 Chart 2: Unemployment rate continues to fall. Chart 3: Labor force participation rate continues to fall which is not good, but employment to population ratio is rising, which is good. 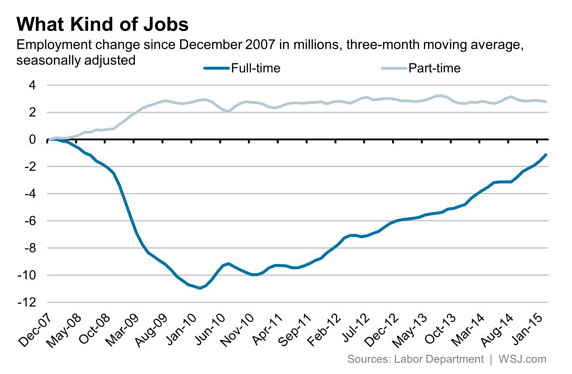 Chart 4: Even though the type of jobs are improving, we are still seeing more part-time jobs than full-time jobs. 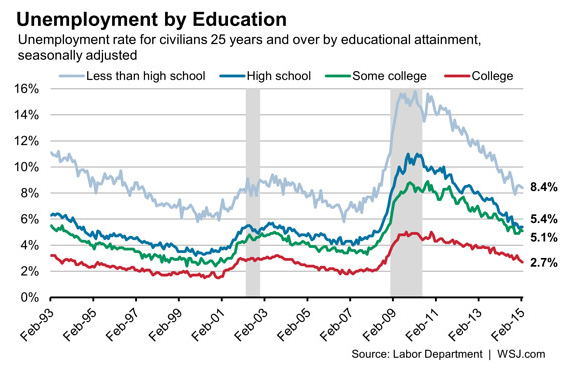 Chart 5: Unemployment rate is falling for all levels of education. 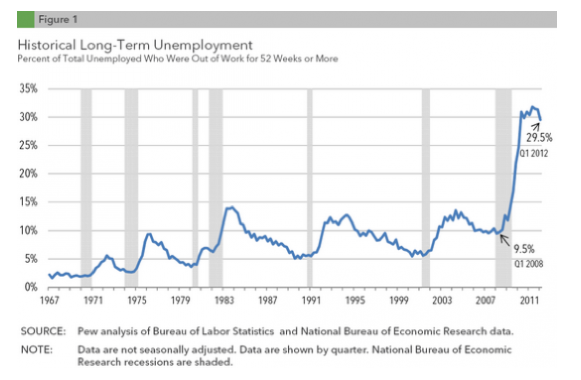 Chart 6: Long-term unemployment rate has steadily fallen, suggesting that the job market is improving. 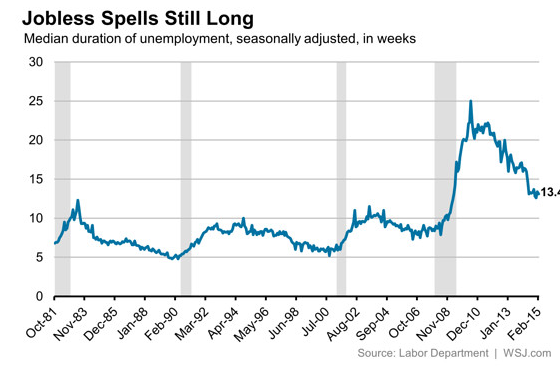 Chart 7: While length of unemployment remains higher than pre-recession period, it is also falling. Chart 8: While long-term unemployment is still above pre-recession levels, short-term unemployment is below it. Chart 9: Even though average hourly wages remain relatively stagnant, the number of hours worked is rising, which is driving up average weekly earnings over the last quarter. Chart 10: Recent surge in employment suggests that we might be near full employment. When evaluating labor markets, it is more useful to evaluate them over an extended period. 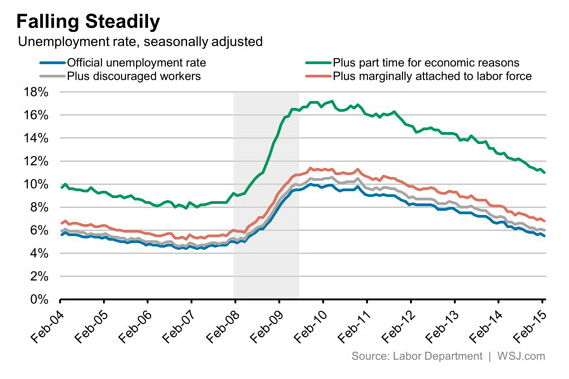 Most of these ten charts suggest that the U.S. labor market is headed in the right direction. I know everyone likes a conspiracy. Obviously, hedge funds manager Kyle Bass appears to infer the government is the Bureau of Labor Statistics (BLS) ‘semi-rigged’ the unemployment statistics. 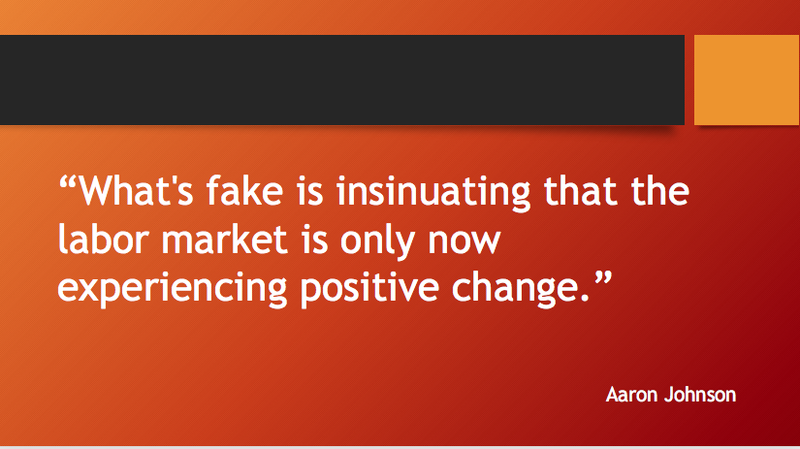 In an interview on CNBC Squawk Box interview, Bass says that an improved unemployment rate is deceptive. He expects that the unemployment rate might even drop further, but it will be misleading because it will be a result of people dropping out of the labor force rather than jobs being created. While he might have a valid point, it is incorrect to suggest that the government does not track ‘true’ unemployment. Economists recognize that the ‘true’ unemployment rate not only tracks those currently looking for a job, but those that want a job and quit looking due to being discouraged. This is measured and is located in Table A-15 of the monthly job report, thus not hidden from the public. Unlike his claim that the true unemployment rate is 11 percent, this alternative measure of unemployment is actually at 12 percent. Now before giving Bass praise for pointing out a supposed weakness in the unemployment rate, it should be noted that this figure has been steadily dropping over the last year. In fact, it has dropped substantially from the last year when it was 13.6 percent. Since the end of the recession in June 2009, we have recently seen a steep decline that suggests the job market is improving. Having said that, it is obvious that the jobs picture is not perfect. Even though part-time employment has declined over the last year, it still remains highly elevated from the pre-recession period. 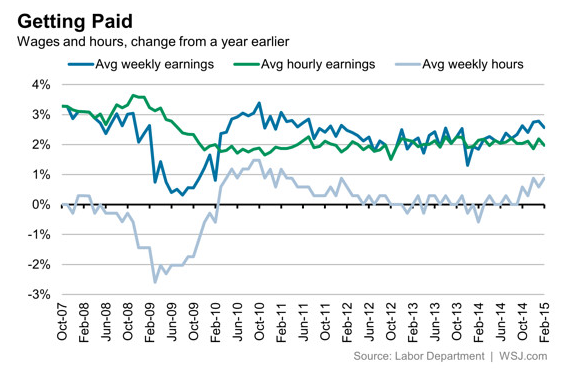 Also, wages also remain stagnant. In my opinion, the main problem is a changing landscape of the economy where we are seeing a shift from value in using our hands (manufacturing) to using our minds (services). Right now, we are in a transitional phase with plenty of low-paying, low skill jobs and many high-paying, high skill jobs. 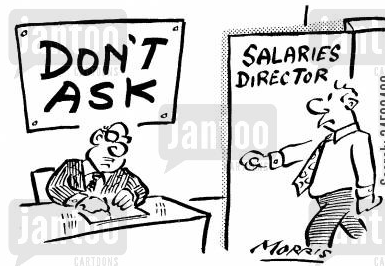 The problem is there are not enough decent paying, middle skill jobs. Until these workforce skills are updated, wages will remain stagnant. While it makes for good TV, do not be fooled with this faux conspiracy. Why 3.8 Percent Unemployment Rate Could Be Bad? Lauren Weber of the Wall Street Journal cites a research paper showing that the unemployment rate will soon get down to 3.8% within the next fifteen years, which sounds good. Given that the unemployment rate is However, this is deceptive because they’re saying that will be due to labor shortages. I address this concept in a previous blog entitled “Why A Lower Unemployment Rate Is Not Always Good”. The main problem is that we will be having a large segment of our workforce retiring, but there will be challenges in replacing this skilled workforce. By retiring, they will leave the labor force and that will lower the unemployment rate. 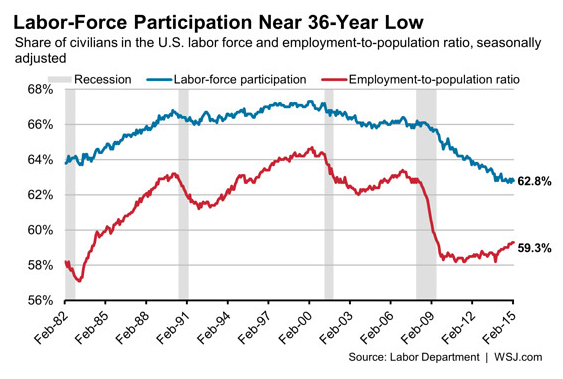 In addition, you have younger workers, who have been slow to adapt to a changing labor force. While they are attaining college degrees at a faster rate, it is not necessarily in disciplines in high demand, such as STEM (science, technology, engineering, and mathematics). If they become discouraged and drop out of the labor force in large numbers, then that could lead to a misleading drop in the unemployment rate. 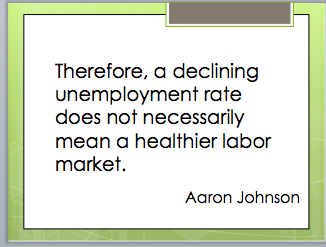 Therefore, a declining unemployment rate does not necessarily mean a healthier labor market. In my inaugural three on three series, I will highlight three positives and three negatives that can be gleaned from July’s unemployment report released by the Bureau of Labor Statistics (BLS). We saw the unemployment rate fall from 7.6 percent to 7.4 percent over the last month, and also experienced job growth of 162,000, which represents thirty-four consecutive months of positive job growth. A broader measure of unemployment (U-6) also decreased over the last year and is now down to 14 percent from 14.9 percent last year. Prospects of the long-term unemployed showed improvement with the median length of unemployment down from 16.8 weeks last July to to its current rate of 15.7 weeks. This was the slowest amount of job growth since March and it fell short of analyst expectations of 180,000 jobs that were expected to be generated. Most of the job growth occurred in seasonal industries, such as retail trade and food services, while manufacturing and construction activity remain stagnant. While the labor force did not shrink much over the last year, the number of discouraged workers increased from 852,000 to 988,000. 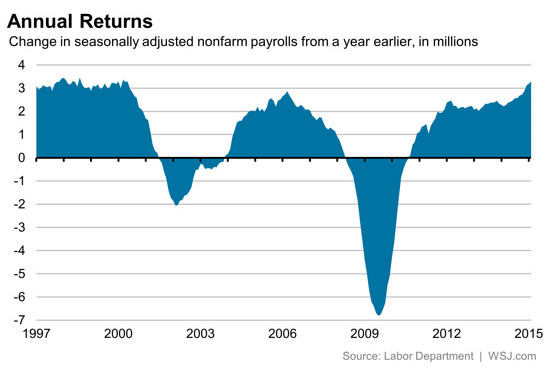 In summary, the July jobs report was adequate, but little suggests that momentum is rising. The next three months will be critical as we will see whether sequestration and congressional gridlock will darken future job prospects. The U.S. economy is his kryptonite. 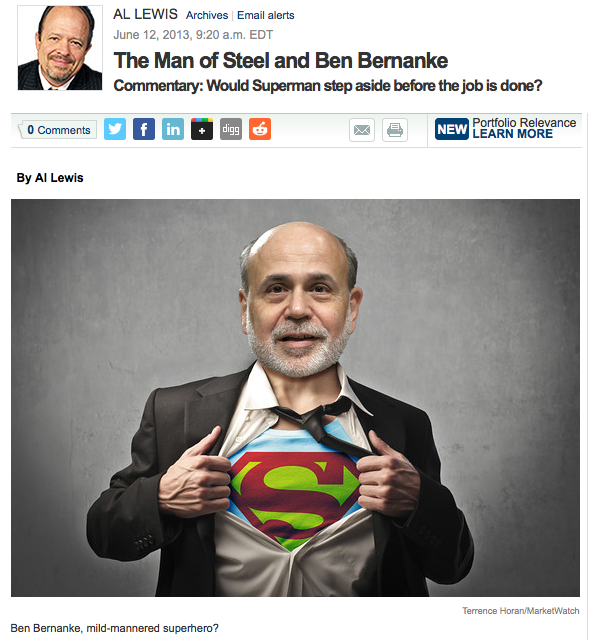 Al Lewis of MarketWatch offers a satirical comparison of Federal Reserve chairman Ben Bernanke to the “Man of Steel”. Both Lewis and my comment could be described as cheap shots to him. 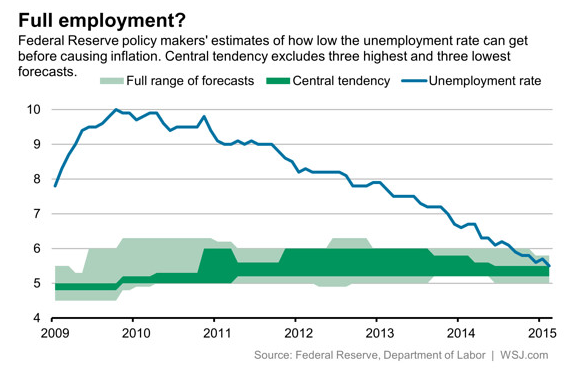 However, being fair to Bernanke, his tools are limited in turning around the economy and unemployment. Still, if it was up to me to grade Bernanke’s performance, it would rate from a C- to C. His best work was preventing a huge collapse of our financial system in 2008. Even though some of his actions might have been questionable, many people do not realize how close the U.S. was to experiencing a depression. Through creative monetary policy, he was able to create liquidity within the financial system without spurring significant inflation and for that he deserves credit. While Bernanke’s critics have predicted that his aggressive monetary policy would result in high inflation, it has been four years now and inflation remains moderate. Having said that, we cannot say that his efforts have not caused any negative consequences. Some of the global instability, such as high food prices in the Middle East, Africa, and other developing nations, can be attributed to the U.S. and their efforts to keeping the value of the dollar low in order to kick-start the economy. With U.S. dollars serving as the primary financial vehicle in the global economy, a cheaper dollar made credit more accessible not only in the U.S., but throughout the world. On the surface, that sounds good. When developing countries are able to access more credit, then that will lead to more investment and consumer spending. However, the downside is that it can lead to over-investment and cause asset bubbles. It is similar to U.S. households, who cannot resist low interest rate offers, and get into trouble by increasing their debt levels. Even though it will enhance their standard of living in the short-run, it can result in devastating outcomes when economic conditions change. We have seen potential asset bubbles start to emerge in China, India, Brazil and other emerging countries. With this occurring, inflation has started to rise in all of those countries and there is concern that their economy will suffer severely as a result. Even though that has not happened yet, its threat remains and the U.S. should bear some of that blame. Referring back to U.S. performance, it is true that the U.S. has grown steadily since its collapse during the end of the Bush administration when our economy contracted by a staggering rate of -8.9% during the 4th quarter of 2008. Since that time, we have shown steady improvement, but it has been very slow. Subsequently, our economy would shrink further the next two quarters, but at a much slower rate. But since then, our economy has grown consistently, albeit modestly. Historically, we want to see economic growth of at least 3%. In over four years, we have only exceeded that benchmark three times out of seventeen quarters. When looking at unemployment, the figures are even worse. Historically, an economy is performing at capacity when the unemployment rate is between 5-6%. The last time that the unemployment rate fell below the 6% mark was July 2008. While we should be encouraged by the drop in the unemployment rate from 10% in October 2010 to its current rate of 7.6%, that is still a very high number. 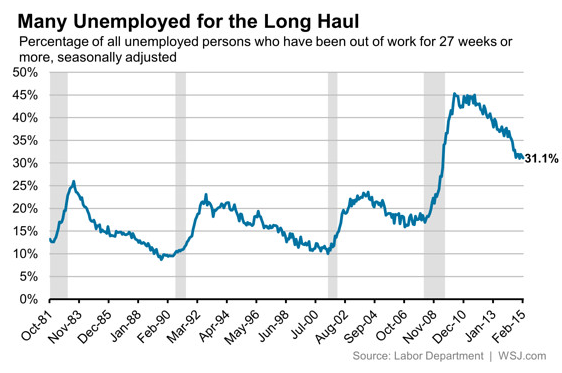 Another disturbing measure is long-term unemployment, which continues to be a problem. Pew Fiscal Studies showed that 9.5% of the unemployed were searching for work for at least a year in the first quarter of 2008 and that has jumped up dramatically to 29.5% in the first quarter of 2012. These high rates have never been close to being matched in past history. The economic evidence is clear. Bernanke is no Superman.